Manse Opus are delighted to announce that the pre-let to Meggitt PLC at Prospero Ansty has won Deal of the Year at the CoStar Awards, as voted for by their readers. In Spring 2018, Manse Opus in their joint venture with Rolls-Royce, secured planning consent for a 490,000 sq ft new headquarters building for Meggitt PLC, which is the first pre-let on the 2.3 million sq ft advanced manufacturing, research and office development site. The deal will be one of the UK’s largest industrial lettings for many years, and is confirmation of the manufacturing industry’s strength at a time of great political uncertainty. 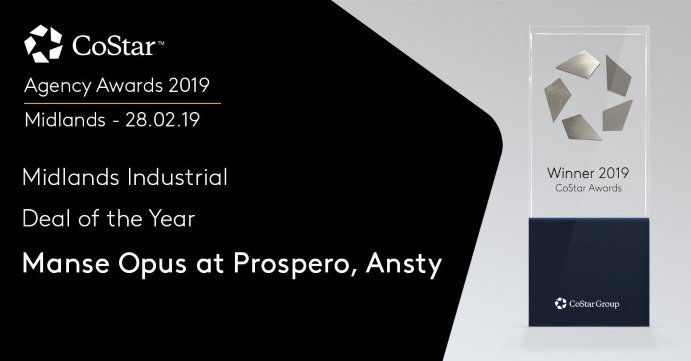 It was also recently announced that the Prospero, Ansty project has also been shortlisted for the 2019 Property Week Awards Deal of the Year. The winners of this award will be announced on the 24th April at the awards ceremony, and the shortlist falls within what is a special year for both Manse and Opus Land, who are celebrating 10 years and 20 years in the industry respectively.